This is all using the actions type definition found in the Nuxt example here: https://nuxtjs.org/examples/typescript-vuex (and in use in the codesandbox link provided -- see store/index.ts). If I remove that, I get a "Property '$axios' does not exist on type" error instead. Types are picked up correctly and I'm able to use this.$axios methods. Types are not correctly picked up and builds subsequently fail. I tried to use axios do the same thing and everything is just fine. It works fine in methods , mouted() ,etc. I am a fresh man to Vue and NUXT. I find an interesting point. 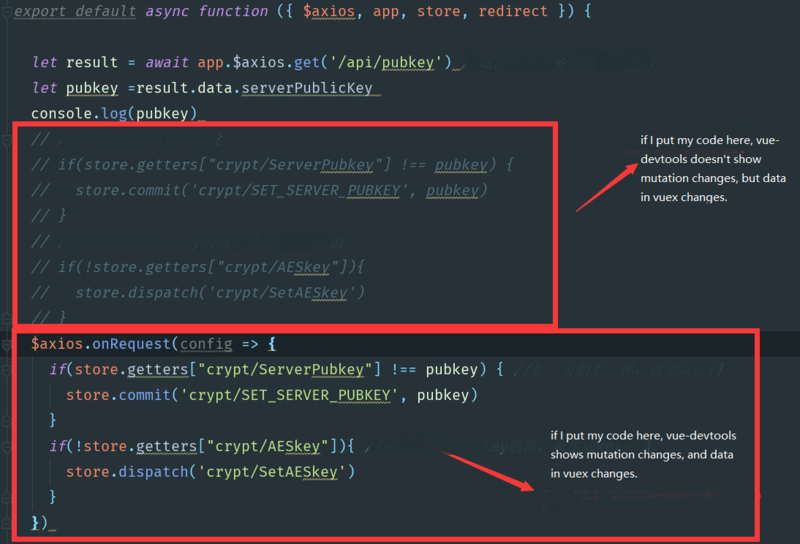 I don't know why mutation changes cann't be seen from vue-devtools when I write code outside onRequest. 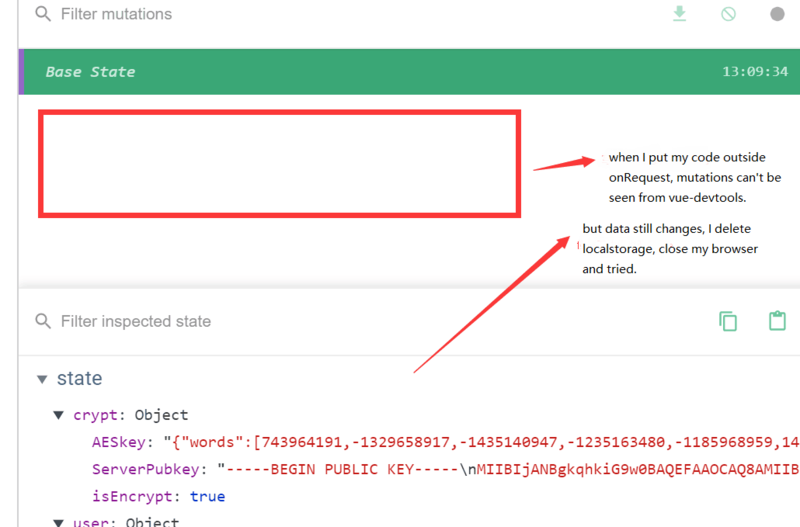 I mean the mutations still happen and vuex store these data, but when I use some plugins like vue-persist or vue-persistedstate to persist my vuex into localstorage. It doesn't work when I put code outside. Wait for you reply and thank you very much. The interceptor successfully returns some data and the action continues, committing that data to the store. Despite the interceptor having a successful retry and returning valid data, the axios call in the store action returns undefined. In other words await.$axios.$post(...) triggers an error which is successfully intercepted but is undefined. It should be equal to the value returned by the interceptor. I'm trying to catch 401 errors, refresh JWT token then retry the original request. Here's the code in @/plugins/axios which is successfully refreshing the token and retrying the request but the original request isn't saved to the store. Should I be going about this in a different way? In our app, we use multiple api which need different default config so we can't use this module. We use axios/axios and create multiple instance with their own config. Is it possible to do something like this with axios-module ? I am struggling to understand why the port 443 is not being included in my baseURL string everytime I am making a login request. 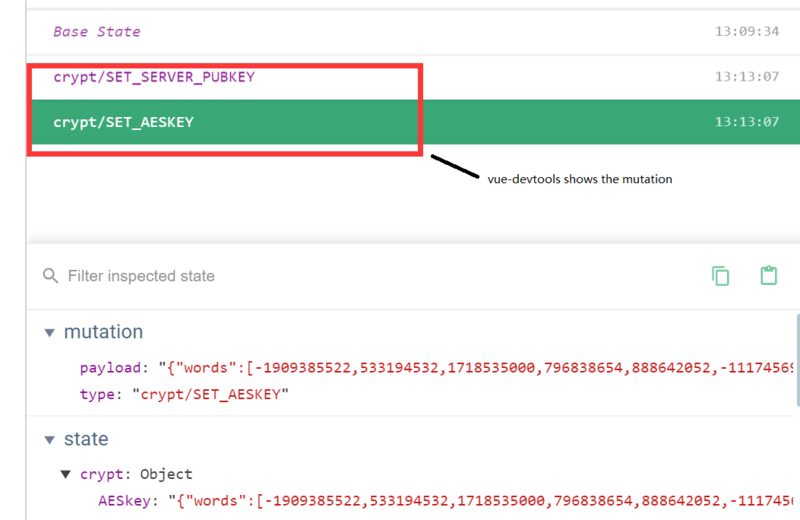 I have set the APIURL environment variable in my .env file to be "APIURL=https://blahhh:443/staging", and everytime I view the request in the network panel of my chrome browser, the requested URL is without the port number: "Request URL: https://blahhh/staging/api/auth/login"
Could someone help me to understand what I am missing here? I have attached a couple of screenshots to explain. I'm sending POST request to my Laravel app. I have 2 cookies which was set before by Laravel. So to send cookies, I've enabled credentials in config file. Now the problem is axios is sending one extra header which prevent request from sending (just preflight is sending). As you can see the first header is the one that is making the problem. I have to say I’m completely puzzled by the way Nuxtjs/axios is behaving. I have two separate apps, front end (Nuxt.js) and backend (Django REST API). The backend root endpoint is backend-url.com/api/, and my relevant endpoint is backend-url.com/api/todos/. frontend-url.com index page is set to fetch() data from backend-url.com/api/todos/ on page load. Here’s what’s happening: when I load frontend-url.com homepage, the app loads nicely and items are fetched, but if I navigate to frontend-url.com/about by clicking on nuxtjs-link and then click a nuxtjs-link back to /, I get a server error. It seems that turning proxy on causes this behavior. 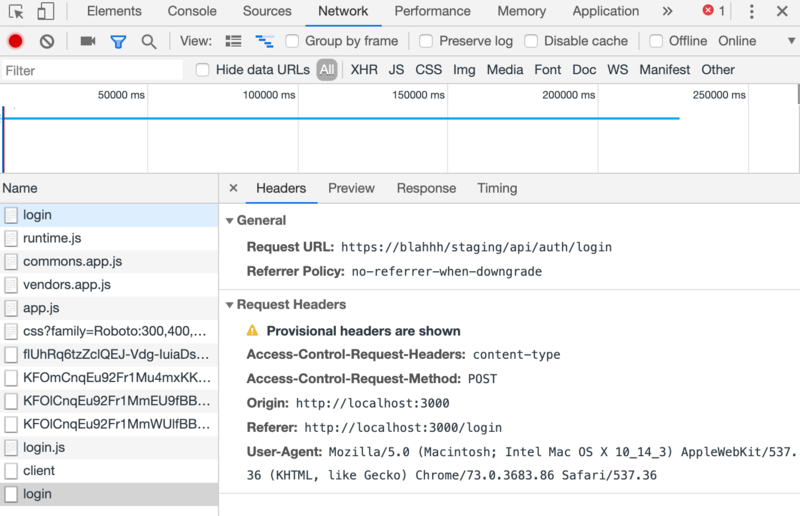 In my logs, I see that on initial page load the API app is getting pinged, while in the navigation scenario frontend's axios is trying to reach for 'todos' instead of 'api/todos/'. Again, this all works on the first page-load, but never from within the client side navigation. What's causing this? What am I misunderstanding in the settings? Of course I don't want to prepend 'api/' to all my axios calls. Is it possible to make an axios request without using auth module headers/token? Transition while looking at Developer Tools console. Just as route is updated in asyncData, it should be updated in interrupts as well. The route changes normally in asyncData() of each page every time the page transits. However, the interrupted request does not change route regardless of where it is transitioned. It does not change from the route at the time of SSR. And, from is always undefined. I've posted my question using cmty.app, but scrolling through the questions gives no hope as almost none has been resolved or at least commented in the last 5 months, so I'll give it a try by posting here. When an Express.js endpoint is POST-called from the middleware by using context.app.$axios.post(theURL) the endpoint modifies a key-value pair of an existing object in request.session, but the changes do not persist. Same POST addressing from the page component using this.$axios.post(theURL) does result in a desired change in the session object. Searching through issues and the documentation of both https://nuxtjs.org/api/context/ and the axios module I didn't find anything related to my problem. What is the issue caused by? Is it because of the server-side-rendering? While debugging I've been logging session ID's on the backend and the SSR calls from the middleware had the same session IDs as calls from the already rendered component that I've mentioned above, so I think the SSR may not be the cause. Issue submission template gives URL where new issue can be submitted. Issue submission template gives a broken URL. I have developed a large Nuxt app that uses the Axios module, on the client, to get data from the server, using relative URLs in all requests. This works fine in development, because of proxy settings. But when I build the app for production (in SPA mode), the client side always tries to send its requests to http://localhost:3000/. I am not sure how to get it to stop this. I do not want to hard-code the URL of the actual server in an environment variable or other config; I just want it to send its requests to the server from which the page was loaded. This is default behavior for axios, but it seems that the Nuxt axios-module is forcing a setting of baseURL when I don't actually want one. How can I get axios-module to simply send requests with the relative URL I give it, without trying to add any base URL? Your issue template says to submit issues through https://nuxtjs.cmty.io/issues/new, but that URL doesn't exist. With only nuxt and nuxt/axios, I added the code shown in JSFiddle to plugin/axios.js. 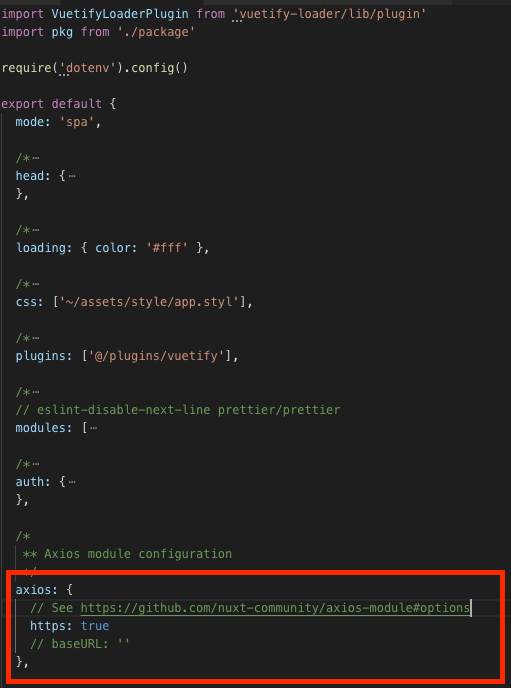 I read that $axios can be used in a custom plugin but I don't know how to do it ? How can I use axios?